These smart strategies can help you to break your PR in no time. Everybody knows that in order to run faster, you must work harder – but these changes don’t happen overnight. If you want to run a faster race, you can shave a few seconds (or maybe more) off of your finish time with a few strategies. If you want to finish your next race faster, try some of these tips. Take time before the course to determine all you can about it. Find out how many hills there are, what kind of terrain you will be on for approximately how long, and so on. This will give you a better idea of how to pace yourself adequately and will also help prepare you mentally for tougher spots. If the race course is nearby, take advantage of its close proximity by running the path or parts of the course while training. Check your form periodically. Every mile or so, assess your running form of your whole body. You can easily waste energy with bad form, so keeping your form in check is a telltale way to keep your speed up. Your stride should be short (with your feet close to the ground). Look ahead, keep your shoulders relaxed and your hands only gently clenched to maintain proper form. Your arms should not be swinging side to side while you run but back and forth. Your hips should be aligned below your shoulders. The concept of running the tangents is to run the shortest possible distance by running straight lines from one curve to another. Although race courses are well-measured, many racers run a farther distance by following every curve in the path closely. Line up properly at the start so you do not waste time and energy getting around slower walkers or runners. Another way runners lose time starting out is by going out too quickly once a race has begun. If you push yourself forward too quickly, you will burn your energy stores faster, leading your muscles to fatigue more quickly. This will leave you feel worn down and depleted near the end of your race. Do not stress about mileage. Relax your pace so your body can push through the entirety of the race. And although this may sound counterintuitive, when training, take your watch off and listen for your body’s feedback. Become more aware of how your own body responds to things like fatigue, breathing, tension, and form. You will be a better runner overall and this can help you to kill your time on race day. Try to get to the race start early so you have time to use the facilities before the race begins. Stopping at port-a-potties can slow you down significantly. Whether you are doing a 5k or a marathon, these tips have the potential to serve you well and help you to finish your next race in better time. Read these tips to keep safe and prevent burnout during hot weather runs. Things are starting to heat up outside, which means now is a great time to start preparing for running in the heat. Heat and humidity can make running a greater challenge and wreak havoc on your pace. In warmer weather, your body has a harder time cooling, causing your body to work extra hard. Your heart rate elevates and breathing becomes more rapid than it is during your normal pace. But fear not. There are a few tricks for running in the heat that will keep you going safely. Hydration is key when it comes to running at any time of year, but it is especially important when in the heat. If your workout is less than 45 minutes in duration, water is all you need. But if you run longer than 45 minutes, you should aim to drink 3 to 8 fluid ounces of sports drink every 15 to 20 minutes to replenish electrolytes and energy stores. According to new research in a recent study at the University of Arkansas, thirst alone is not the best indicator of your need for hydration. Your body may take about two weeks to adapt to running in the heat. Slow your pace, reduce your intensity and be patient with your body rather than trying to push through it. This will enable your body to acclimate so you can continue to run without running into burnout. Your body will slowly become better at cooling off so you can run at your normal pace again. This is especially important for new runners, but all individuals can benefit from this. Allow power breaks every 4 to 8 minutes when getting started with running in the heat. This allows your body to cool down some, helping you to manage your core body temperature. You want to avoid your body temperature rising too much, at the risk of overheating. Overheating can slow you down a lot. The temperature is usually cooler in the morning and evening. If you run in the morning, you may run into higher humidity but will still be able to avoid the high temperatures of the day. The air quality is generally better in the morning as well. Avoid running between 12 and 3 pm. If a heat alert or poor air quality have been listed for the day, consider running indoors. Running outdoors in dangerous heat will do you much more harm than good and can force your body into overdrive, taking more time to recover from the workout than usual. Nobody will judge you for hitting the treadmill for a day or two. Dress in technical apparel that is light colored, loose-fitting and wicking, which allows moisture to pass through to be evaporated. This will help to keep you cooler. Protect your eyes with sunglasses that filter UVA and UVB rays and perhaps a hat or visor as well. Don’t forget to put on sunscreen. Struggling to get moving? Try these tips! We all have experienced it – that sluggish feeling that keeps you less-than-motivated to gear up for your next run. Sometimes a couple days off is all you need, but there are some other things you can try to add a little pep to your step. One study found that regular walking intervals during a long run can help you maintain the same pace that you would have if you ran the entire way while being gentler on your body. Walk breaks are more than just physical, though. 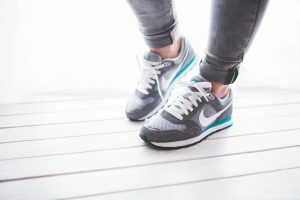 Walking breaks can help you overcome mental barriers as well, helping you to look at hurdles of long distance running that once seemed overwhelming as more manageable, smaller pieces when you incorporate walk breaks. You may benefit from a break from the pavement. You can still get a good workout in while playing a sport. Softball, soccer, field hockey, ultimate Frisbee, basketball, and rugby are great ways to get a run in without calling it running. Look for a local league or just play for fun with friends to give your mind a break from those long runs. Although some health gurus might say otherwise, one study published in the British Journal of Sports Science revealed that people who drank a cup of java before a timed run on a treadmill finished quicker than those who were in a placebo group. If you are not into coffee, try an herbal caffeinated tea. Sometimes slowing down is the ticket to making a run feel better. If you regularly battle getting going on your runs, schedule an easy day specifically for slowing your pace. You should be running at a pace that is slow enough that you can speak in short sentences. If you have a hard time slowing down, consider running with a friend to ensure you stay slow enough to be able to speak. Grab a carb-rich snack before hitting the pavement. A few carbohydrates can bring your blood sugar stores up and improve your mood. Cue up Spotify and create a pump-up playlist that will get you moving. Studies have proven that music can increase your motivation and improve your performance when running. You can even create playlists that are unique to the kind of run you are on with different tempos for long runs, races, and so on. According to Scientific American, music helps to distract people from fatigue and pain while increasing endurance and elevating mood. Music may also be able to promote metabolic efficiency. Are you dreading your workouts because your joints are aching or your miles feel somewhat flat? You may need a new pair of running shoes. If you haven’t replaced them in the past 300 to 500 miles, it may be time! With these simple steps, you can hopefully overcome any mental hurdles keeping you from training for your next race. Regardless of your level of running, here’s why rest days are vital. Many runners have long lists of goals they want to accomplish. When looking at your list compared to your schedule, it is easy to breeze over rest days. Why would you slow down when you have so much to cross off your list? The answer lies in the importance of rest days. Taking a break is as important as making time for longer runs. Rest days play an important role in strengthening your body as well as sharpening your focus. Rest days are also helpful because they give you time to recuperate so you actually want to continue with training. Rest should never be skipped over. Each time you run, your body actually experiences a breakdown of a tiny amount of tissue. Rest days allow you time to recover after, making it possible for you to hit the pavement again for your next run. Your body needs time to adapt so you can get stronger (and faster if that is your goal). If you fail to take rest days, you may find you develop staleness to the idea of training, making it harder to stay on schedule. On rest day, your body also uses nutrients and experiences hormone and other biological changes to rebuild itself. Regardless of whether you are a regular trainer or a recreational runner, there is good reason to take a day off each week (or more)! Here are four of those reasons. Rest is vital when it comes to trying to avoid an injury. Rest days allow your body time to fully repair. The impact of running can stress tissues, which can increase cell turnover and forces the bone to become stronger. But your bones need time to repair. If you do not allow yourself time to rest, you may wind up with a stress fracture. You create microscopic tears in your muscle fibers any time you exercise, including when you run. Those fibers are rebuilt by your body in preparation for the next running session. This is great but there is a catch. The rebuilding response only occurs when time is taken off. Depending on the intensity and duration of your training session, your body needs a minimum of 36 hours to rebuild. Without rest time, your muscles will have no time to recover and will only continue to break down. Running is a form of stress relief, but each time you run, cortisol (the stress hormone) increases in your body. The body does not know if you are running for fun or running from danger, so it amps up the amount of cortisol flowing through you. Increased cortisol can cause irritability, mood issues, sleep problems and other health issues if your cortisol levels become too high. If you over train without rest, you can offset your cortisol levels, causing unnecessary stress on your mind and body. Rest and recover to keep yourself in balance. Embrace the elements with these tips. Races are rarely ever canceled for rain. 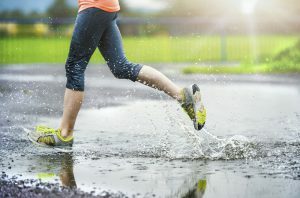 Some runners love a good run in a torrential downpour while others prefer to avoid running when rain is in the forecast. If you are in the latter group, it is important to learn how to embrace the elements and be prepared for inclement weather on a run. Below are some of our best tips for running in the rain so you are not completely miserable. Chances are, with adequate preparedness, you may wind up enjoying running in rain! If you plan to run in shorts, you may want to throw some compression shorts underneath to prevent chafing. When your body is wet, the risks of chafing are heightened. Clothes that fit closely may also help to keep you from getting overly wet. Loose-fitting clothes are more likely to make you feel soaked and heavy. A fitted shirt and spandex shorts are a great option for rain (which can also help to prevent chafing). If the temperature is forecasted to be below 50 degrees, grab a wind shell made of nylon or other waterproof material. This top layer will benefit you if it rains when the temperatures are cool since rain can make you feel even colder. The shell will not keep you completely dry but it helps to hold in some body heat, keeping your core temperature up, thus decreasing any risk of hypothermia. The Brooks LSD Running Jacket is a great option. Wear a visor or baseball cap to keep rain out of your eyes. How Do Your Shoes Look? Take a quick look at the bottom of your regular running shoes. If they look smooth on the bottom, you may want to grab a different pair. Smooth-soled shoes are apt to cause you to slip when running. Look for shoes that have grooves on the soles that are deeper than one millimeter. These grooves enable water to run through them, offering a better grip on the wet road. To keep your feet warmer and drier, look for a pair of shoes that feature waterproof fabric. If your shoes have mesh and you don’t have the time or a budget to buy new shoes, you can wear thinner socks, which may keep you from absorbing much water, which could make you feel soggy and weighed down. Rain can slow you down. If it rains on your sprint intervals day or a day you want to beat your personal record, you may want to rearrange your schedule. 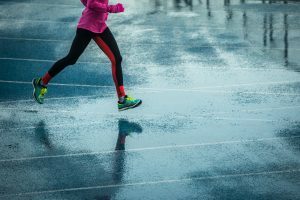 Speed workouts and time goals are not well-suited for rainy days because the weather can reduce your speed. Rain can add as much as two minutes per mile to your total time. Rainy days can also increase your risk for injury for certain types of training. Pushing off and landing on a wet surface adds more demand to your connective tissues and muscles. Endurance training is better suited for rainy days, when you can embrace the resistance provided by all of that wetness. When running on a wet road, you can modify your stride to decrease your risk of wiping out. Instead, take quicker and shorter strides, which will reduce the amount of time your feet spend hitting the wet surface. Remember, if it is storming (and especially if there is lightning in the sky), stay inside.